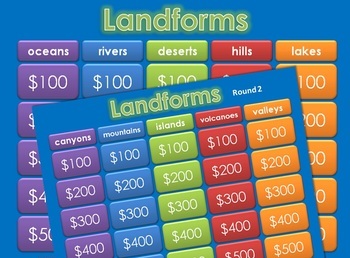 Looking for an exciting way to practice and review LANDFORMS for Second thru Fifth Grade? Here it is..and in a fun, INTERACTIVE powerpoint! 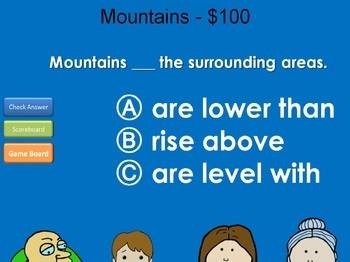 With FIFTY practice problems, in a game show setting, your students will get lots of review. You're going to LOVE the Jack and the Beanstalk themed contestants! These games do not appear to work on Macs. If you have a Mac, please pass on buying this product. 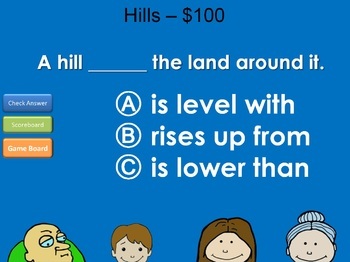 Please be aware that these follow the same questions that are in my Landform task cards and Smartboard/Mimio lesson. They are just presented in a different format! 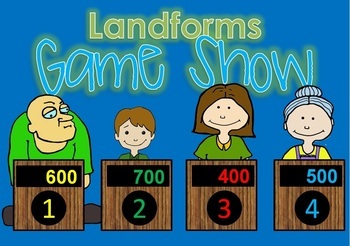 Unlike my other game shows, this show includes TWO rounds! Just click the ROUND TWO on the first gameboard to be taken to the second round. Make sure to return to the Round Two board any time you leave the scoreboard. You AND your kids are going to love choosing which "contestants" team they are on. This lesson includes four Jack and the Beanstalk themed contestants. When you get the correct answer, check it on the screen, then click YOUR team's contestant to be awarded the points! Go to the scoreboard to see all the contestants and their scores! Just like the REAL game. To get the most out of this game you MUST READ THE INSTRUCTIONS first that are included in the document!! My SMARTboard lesson on Landforms.. don't miss out! To use this game show, you MUST enable macros on your computer. This lesson includes a document with all the instructions on how to enable macros. I included screen shots. You do NOT have to be a techie to do this! It's super simple! Just follow the pictures! The lesson also includes the gameboard powerpoint. Once you have followed the instructions in the Word Document, your powerpoint will pop right up in SHOW mode. Having problems? Don't fret! And certainly don't give feedback yet! Let's get this game going! Just drop me an email at iTeachTinyToes@gmail.com so I can get it working for you. Then, of COURSE you'll want to leave some love so you'll get credits for future TpT purchases! Also, let me know which contestants you'd like to see on the show! If you have a smartboard or any other type of interactive whiteboard, you can also use the projection from those and just use the interactive portion without having to convert the file to whatever it is you use! If you're able to "play" a regular powerpoint, you should be able to play this one too! Click the star to follow me... you'll know right away when I've posted new products.